Students gathered in the Henrickson Family Atrium to listen to various accounting professionals. Students from the College of Business gained valuable insight into the world of accounting at Professional Development Days. Hosted at Howard L. Hawks Hall, the two-day event gave students the opportunity to listen to professionals from various sectors within the accounting field. The topics of discussion included long-term advantages of certain professional designations, obtaining a master’s degree, accounting internship experiences and more. Leading a discussion focused on work-life balance, Katie Byrd ’13, spoke at the event to dispel common misconceptions about accounting. She talked about her experience while attending Nebraska and how that led to her current position as an audit manager at Lutz. “Something that originally dissuaded me from public accounting was the thought of having no life outside of work, especially during busy season. Once I entered the world of accounting, I realized employers really take that into consideration and figure out ways to make sure you have a life outside of work. I think it is important for students to know accounting is a reasonable route to take, even if you want to have a family or other passions outside of work. Employers across Nebraska are changing the landscape of the workplace,” Byrd said. Logan Ohs, an audit manager at RSM US, talks to students about geographic opportunities. Morgan Rademacher, a graduate student at Nebraska, came to the event seeking advice pertaining to her enrollment in the master of professional accountancy program. The Omaha native found the words of wisdom she needed from Dr. Aaron Crabtree, director of the School of Accountancy, associate professor of accountancy and KPMG Fellow. 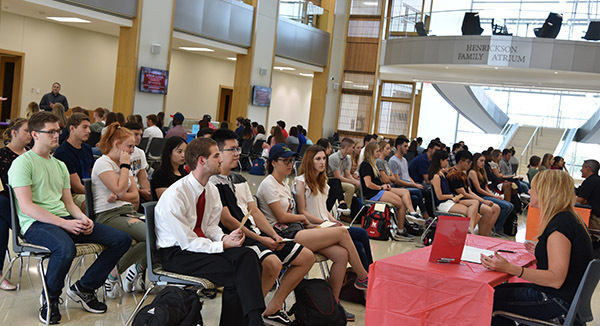 As the coordinator of the event, Jill Trucke, assistant professor of practice in accountancy, provided a wide range of beneficial topics for students. Trucke knows it takes more than being good at debits and credits to obtain a successful career in accounting ­– it requires the ability to communicate and knowledge of how to set yourself apart. To learn more about the School of Accountancy, visit: https://business.unl.edu/accounting.